I’ve reached the age where I’m willing to spend a little more money so I can be comfortable when I travel, and being able to get a few hours of good sleep in the midst of a 30+ hour journey seemed like a good investment. 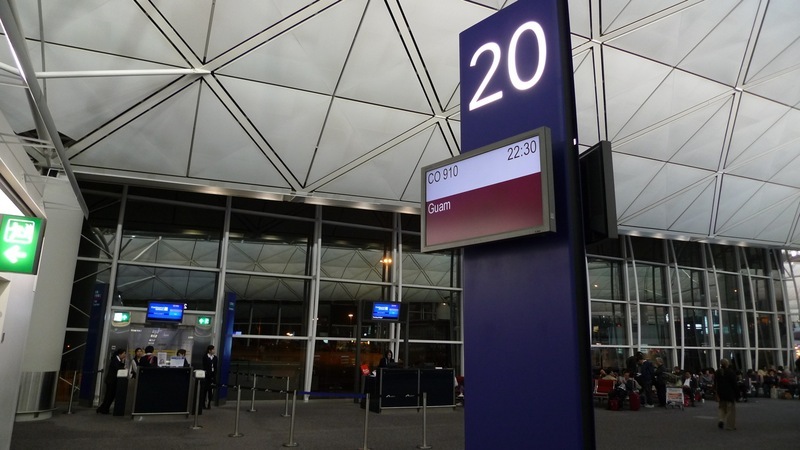 This was the logic behind paying $60 apiece to rent three hours in day rooms at the Plaza Premium Lounge, a public “arrival lounge” in Hong Kong Airport’s Terminal 2. Unfortunately, a few things kept the investment from paying dividends. This particular lounge is located below the train station. While it has soundproofing, you can still hear the “whoosh” of the train arriving every twelve minutes. If I had used earplugs, that might not have been a problem, but the coffee I had with my egg tarts earlier in the afternoon, or maybe just the rush of adrenaline brought on by travel, kept me from really relaxing and sleeping. Nonetheless, I got more rest than I would have just wandering around the city or dozing in an airport chair, so I was thankful for that. The lounge itself was nice and the facilities were in good shape. The staff gave us a bit more than three hours before calling to wake us so the time to shower and change wasn’t held against the three hours we had paid for. Maybe that’s because they weren’t busy that time of day or maybe that’s just how they do it in Hong Kong. Whatever the case, a little before 8:30 pm we were showered, changed, and checked out. We collected our bags from the locker facility nearby and did some rearranging with the packing. On the Air Asia flight, we had to prepay for our luggage, so managing the weight distribution was critical. 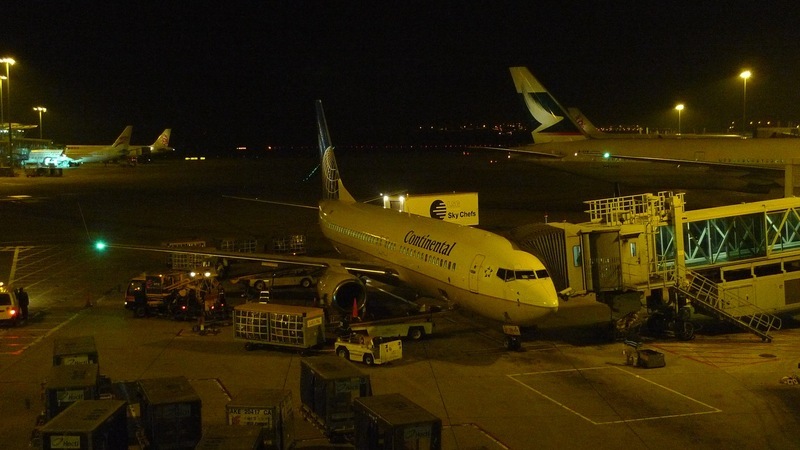 At least for their international flights, Continental offers free luggage check-in, so we could move things out of our carry-on and into the luggage for the rest of the trip. The check-in counters were deserted two hours before departure. 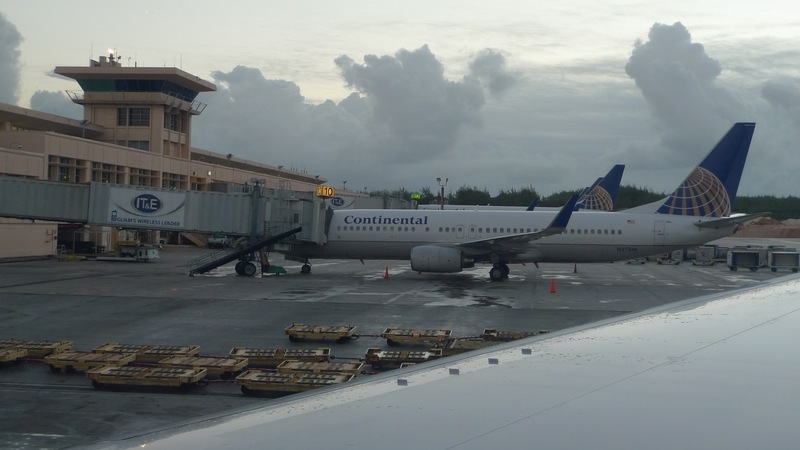 United does the check-in and ground handling for Continental, which operates only two flights a day (to Guam and Newark). UA providing this services is a recent development, brought about by the merger of the two airlines. It took a few minutes for the agent to finish our check-in as there was some confusion about the assignment of my frequent flyer number. (Continental and Taiwan’s EVA Air have a reciprocal mileage program agreement and I was using my EVA mileage program number for these flights.) The agents were friendly, though, and resolved the problem in short order. After the confusion was cleared, our bags tagged, and boarding passes issued, we headed through security and immigration. Unlike many international airports I’ve been to, Hong Kong places security before immigration, which makes more sense to me than at airports like Singapore where you don’t go through security until you are entering the gate. Who’s protecting the immigration officers there? Uncertain what food would be served aboard our four-hour redeye Continental flight to Guam, we stopped for a bite at the popular local eatery Tsui Wah, a branch of which is located in the airport. I’ve noticed that many airports are moving from having just random restaurants or only fast food chains to having branches of popular local restaurants. San Francisco Airport is a good example of this. There you can eat the food from some of your favorite local restaurants inside the terminal. Good idea, in my estimation. At least you get something more interesting than Burger King and Starbucks, again and again, airport after bloody airport. I think this photo says it all. 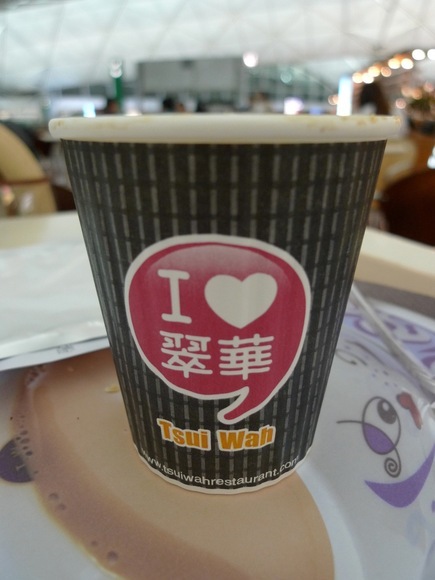 We ate at a full branch of Tsui Wah on our two days in Hong Kong while returning, too. 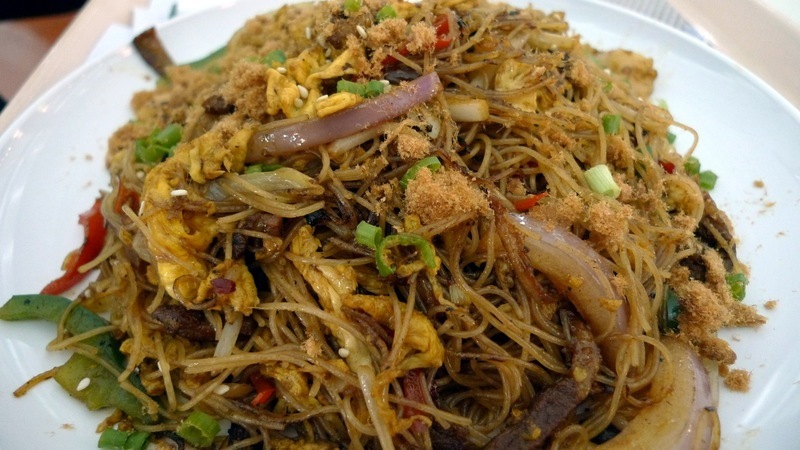 Tawn ordered this dish, which if I recall correctly is a Singapore style curried noodles. I tried a bite and it was tasty and a bit spicy. 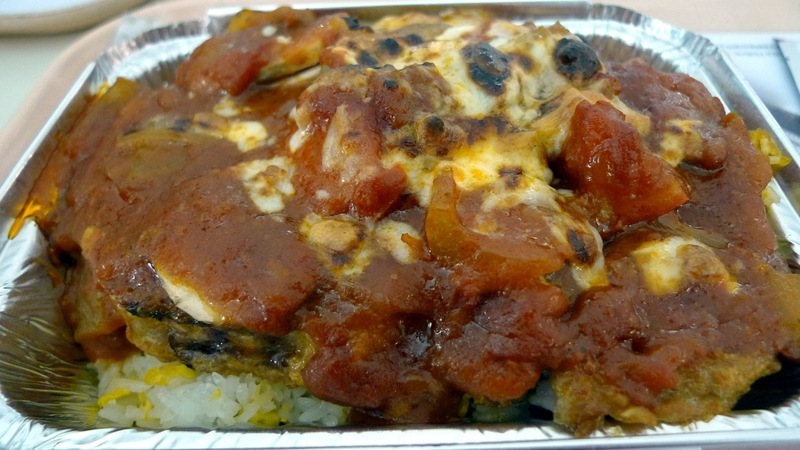 I ordered the baked pork chop smothered in tomato sauce and cheese, served over rice. It took about ten minutes for them to prepare but was worth the wait! 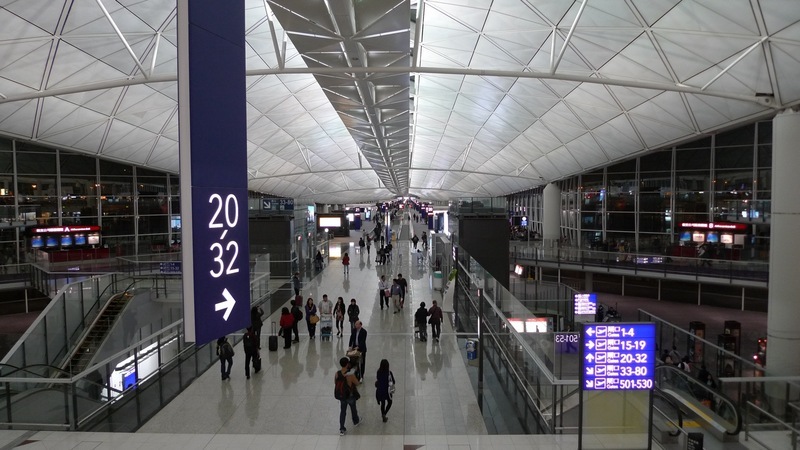 Hong Kong International Airport remains one of my favorite airports. While Singapore may offer free internet, some outdoor gardens, etc. I find HKIA a much more modern, user friendly, and well thought-out airport. The interior also is bright and open, making the travel feel just that much more exciting. It reminds me of a classic European train station, done up in a modern version. 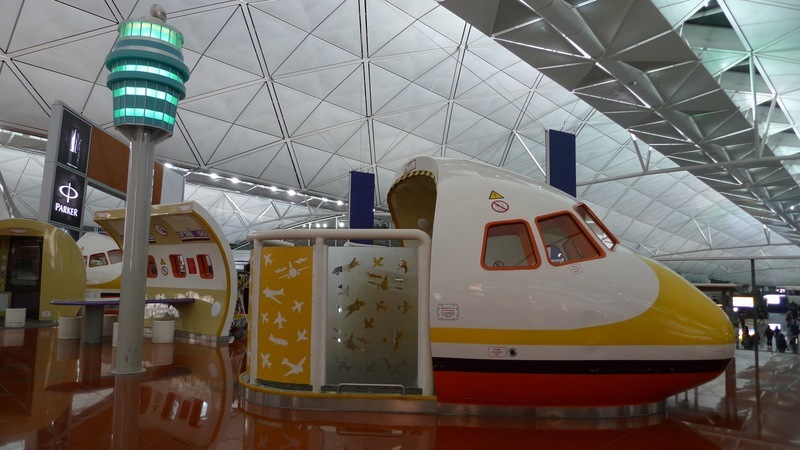 Another benefit to HKIA: it is children friendly. There’s this good sized play area near the main food court. It features many segments of play airplanes, allowing children to burn off energy and learn more about aviation before getting on their flights. The segment about the cabin, left, has all sorts of little details like the stickers on the “overhead bins” showing row numbers. Parents could actually use these as a learning opportunity for their children, pointing out the stickers and practicing how they’ll look for the row numbers once they get on their real airplane. It has all sorts of educational possibilities, not to mention just being fun! This minute-long video beautifully illustrates just how crazy landings into Kai Tak were. Take a look. Departure time was 10:30 pm from gate 20, one of the closet gates to immigration. 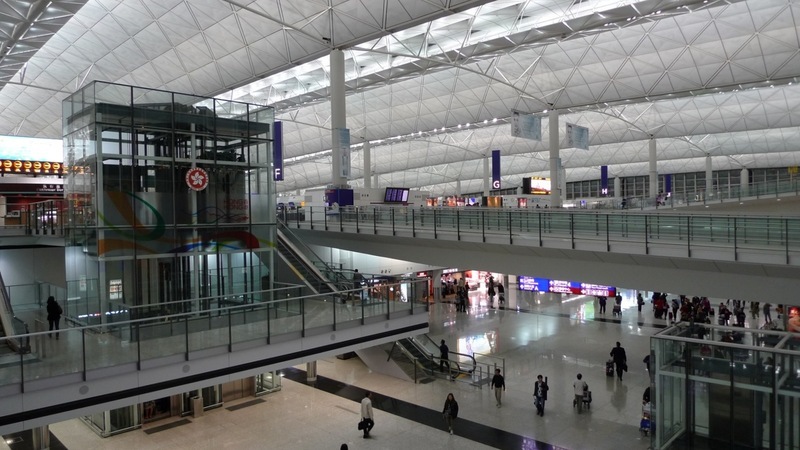 HKIA is a very spread-out airport but unlike the design of Bangkok, there is a convenient train system that will shuttle you to the more distant gates in just a few minutes. In Bangkok, nearly every gate requires a hike, most of which is through a shopping mall of duty free stores. Boarding started about 20 minutes before departure for our nearly full flight. Unlike many trans-Pacific flights, this one was served by a narrow body aircraft, a Boeing 737-800. During the boarding process all passengers were put through additional security screening, which is normal for flights heading to the US thanks to our overzealous policies. However, unlike most airports where this screening is done before you actually enter the gate, here in Hong Kong they have the screening in the ramp leading to the jetway. The result? Passengers had to surrender water bottles they had purchased or filled inside the secured area of the airport, without an opportunity to get more water before the flight. This is extremely cruddy, resulting in passengers not being able to bring their own water onto the flight. To top it off, the United customer service agents failed to mention this procedure either at check-in or in the boarding announcements, making it all the more inconvenient and, because it was unexpected, irritating. On this segment of the flight we had been able to purchase exit row seats (an extra $89 per person) in order to have a little more legroom and get some rest on the overnight flight. Again, our “book the window and aisle” strategy left us with an empty middle seat and some extra room. Note those little “SUV back seat” screens hanging throughout the cabin. More about those in a moment. View of a Pakistan International Airlines Airbus A310 next to us. Beautiful design on the tail. HKIA is a great place to see planes from all over the world, with the exception of Latin America which isn’t well-represented. 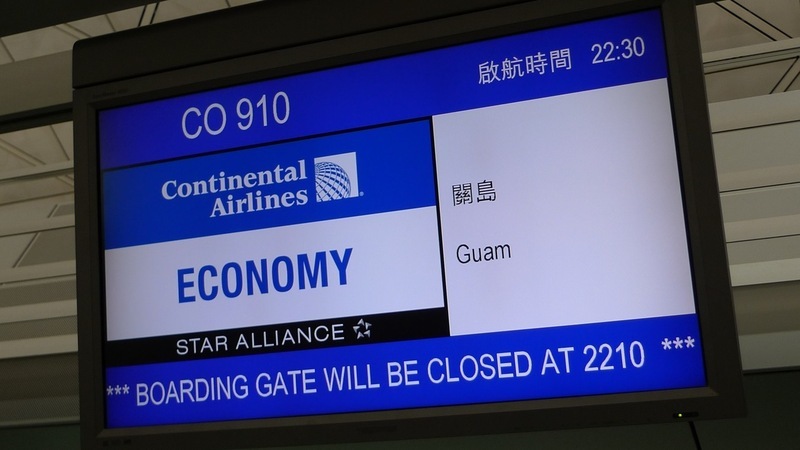 The four-hour flight to Guam was uneventful. 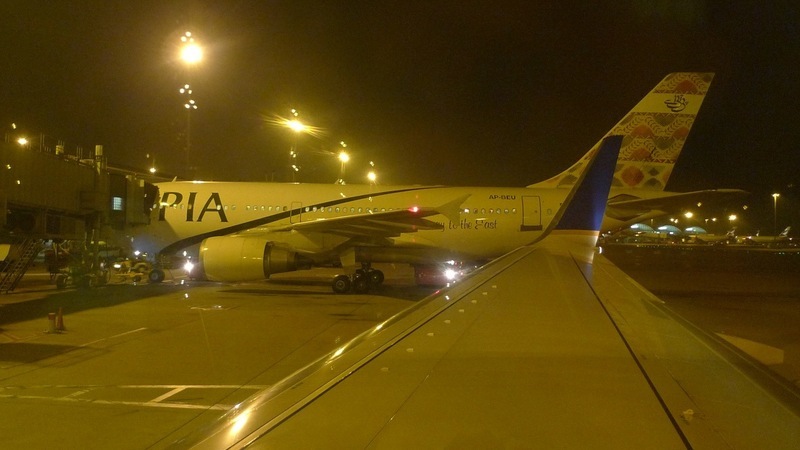 Cabin lights were on and off – mostly on – for the first two hours as we went through lengthy announcements and then a meal service that, for a red eye, seems should have been delivered immediately after takeoff. The “meal” was half a turkey wrap, some fruit, and some almond cookies. About as much as you would expect for an American airline, I think. There was no individual inflight entertainment. This plane is equipped with those “SUV back seat” style monitors throughout the cabin so we all watched the recent Harrison Ford movie “Morning Glory”. Well, as much as we could see it on the tiny monitor four rows away. Headsets were distributed for free and we were encouraged to keep them for use on other flights. I managed to doze a bit on the flight but then it was time for descent into Guam. We touched down some twenty minutes early and taxied to gate 10. As we arrived, I was unsure what to expect, immigration-wise. This was our first point of entry into the US, although Guam is a territory rather than a state. As it turned out, we ended up having to go through immigration, but didn’t have to reclaim our baggage and go through customs. 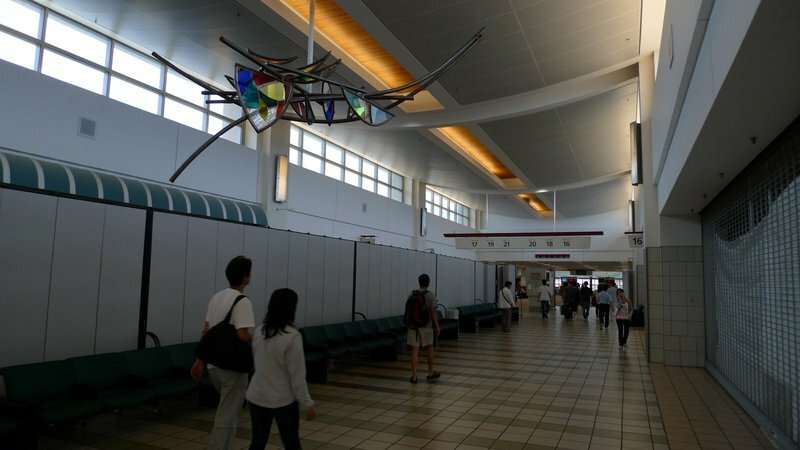 The process was like this: when you arrive in Guam the terminal has these flexible partitions down the middle of the hallway. You are shunted into the “secure” side if your flight has arrived from an international destination. Then you go into the immigration queue just like at any other international airport. After clearing immigration you end up outside security in the ticketing and check-in lobby, so you re-clear security and head to your gate. Back at our gate about fifteen minutes after clearing immigration, we spotted our plane for the 7.5-hour flight to Honolulu. As you can see, from a visual branding perspective, the CO-UA merger is also a merger of identities: Continental color scheme with the United name. That being the case, it has been much faster to update the legacy Continental planes than the legacy United ones. Boarding was already underway when we reached the gate, but the procedure was very strange. Between the gate area and the jetway there was another set of immigration booths, so we had to go through immigration a second time within forty-five minutes, essentially reentering the US. I guess the implication of this second immigration check is that there must be passengers boarding locally in Guam who entered Guam without going through formal immigration procedures. Very odd. The view from my window seat. The plane we arrived on from Hong Kong is the second plane back. Interestingly, the Guam airport seems to be located on a graded hillside and I noticed that the arrangement of the aircraft parking areas is a bit like terraced rice paddies, albeit not at a very steep grade. Look at the building just above the left side of the jetway. Notice how it “steps up” about a meter? It is hard to see in the picture but the ramp is level at the plane’s parking area but then slopes up to the next parking area. You can see the slope where the yellow cargo pallet carts are parked just beyond the wing of our plane. Anyhow, our flight pulled back just as the sun was rising, the same time (6:30 am locally) we had departed from Bangkok the day before, although 24 hours had not quite passed thanks to time zone changes. On our way to runway 6-Right we passed this Continental Boeing 737 in the Star Alliance livery. 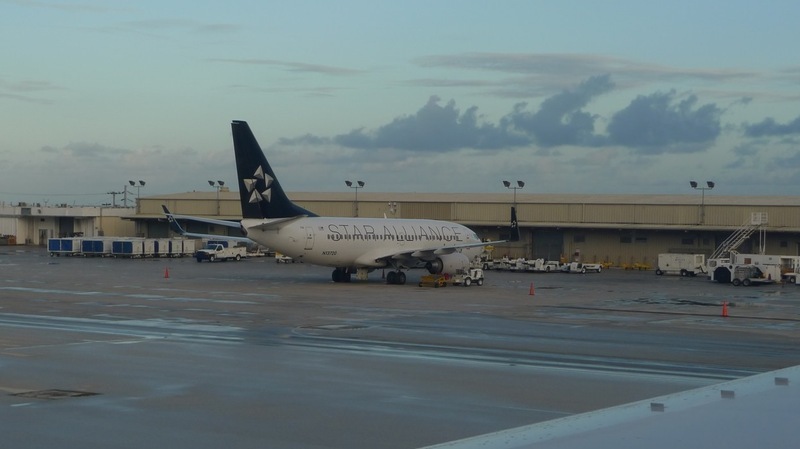 I wonder if some day all the Star Alliance airlines will merge (once foreign ownership laws change) and simply brand the airline as “Star Alliance”? 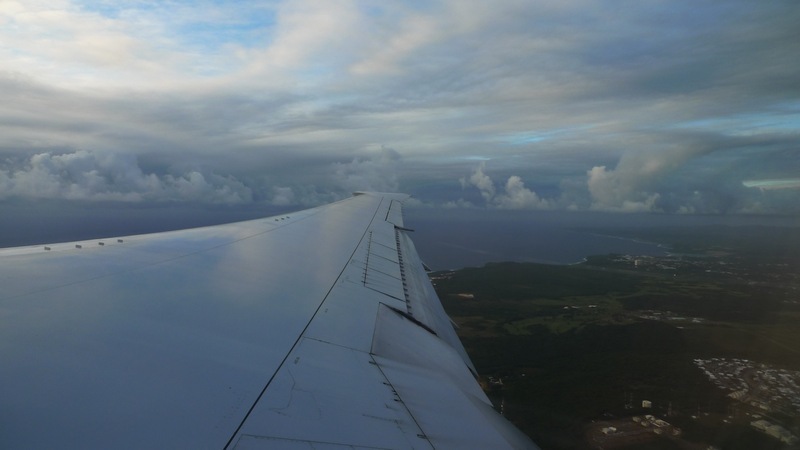 Our climb out of Guam on a cloudy Saturday morning. Our plane, a Boeing 767-400, is a twin-aisle jet with a 2-3-2 arrangement of seats in economy class. 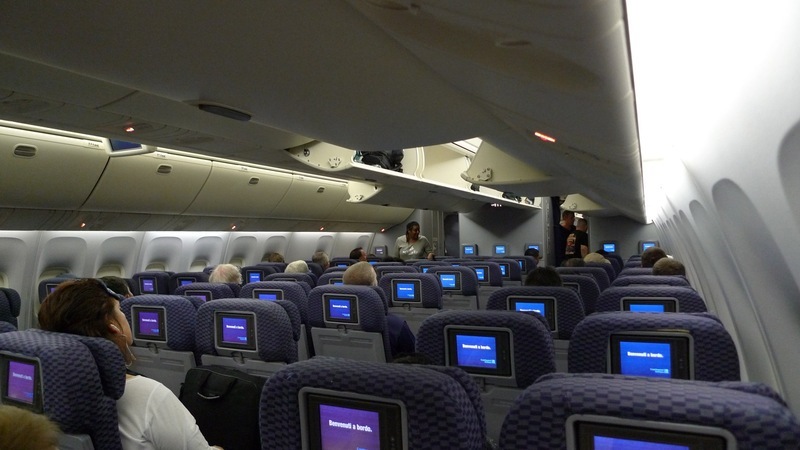 Unlike the plane from Hong Kong, this one was equipped with individual seatback monitors with a choice of something like nine channels of movies and TV shows playing on a 2.5-hour loop. If you happen to tune in at a random time, you will find yourself in the middle of a movie and have to wait until the loop restarts. It is certainly better than squinting to watch the show on a screen half a cabin away, but given the recent advances in inflight entertainment technology (not to mention things like iPods and iPads!) the quality is still pretty low. Interestingly, though, since this flight was technically a domestic flight (although nearly twice as long as our Hong Kong to Guam flight), you had to pay for a headset or else use your own. The seats did have pillows and blankets provided, something rare for a domestic flight. Seat pitch (the point on your seat to the same point on the seat in front of you) is about 32 inches, typical for economy on many airlines and if you empty out the seatback pocket of magazines and the person in front of you doesn’t recline all the way, it is reasonably comfortable. 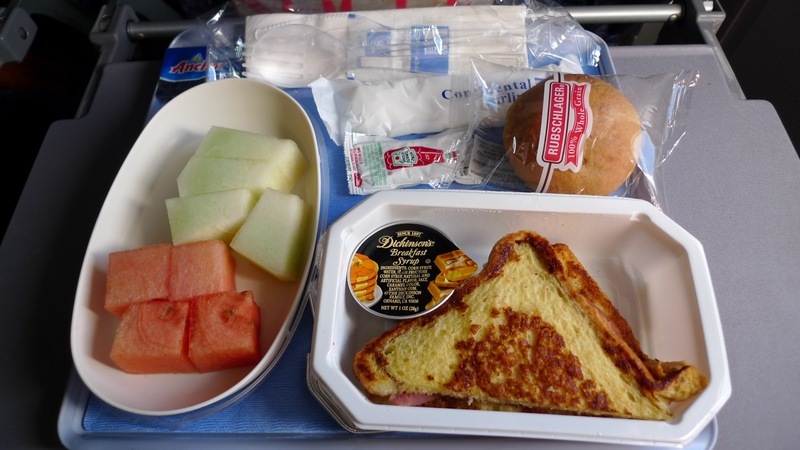 Despite being a domestic flight, free meals were served and they weren’t that bad, either. 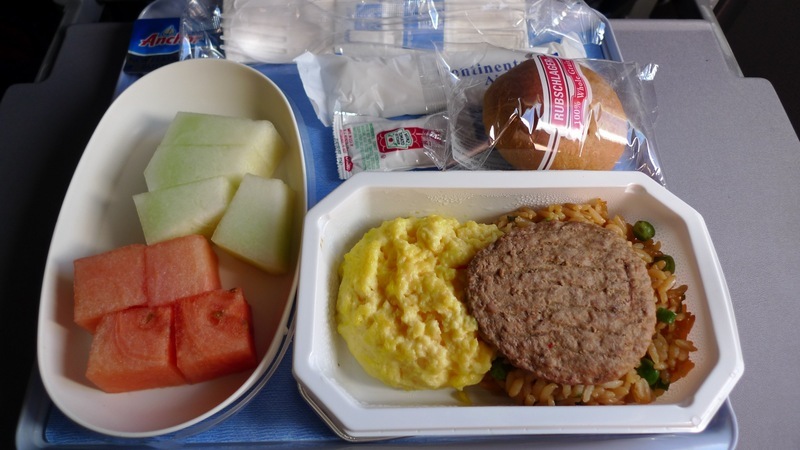 This was a breakfast flight and I had sausage and eggs served over fried rice. You have to appreciate that Continental tries to appeal to the local customers with the fried rice, and it strikes me as a better choice than hash browns. Tawn opted for the French Toast, which was just about basic as French Toast can get! 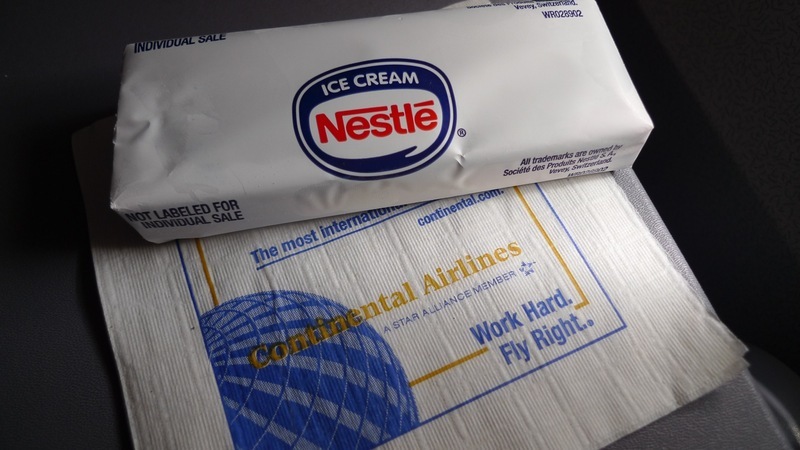 About three hours into the flight, flight attendants passed out ice cream bars as a snack. Thanks to the dry ice on which they had been stored, these ice cream sandwiches were as hard as a rock and I had to wait about ten minutes before I could manage to break off a bite without chipping a tooth! One wonders what would happen if they offered a snack of, say, fruit or carrot sticks. Nonetheless, I can only greet an ice cream sandwich with a smile. 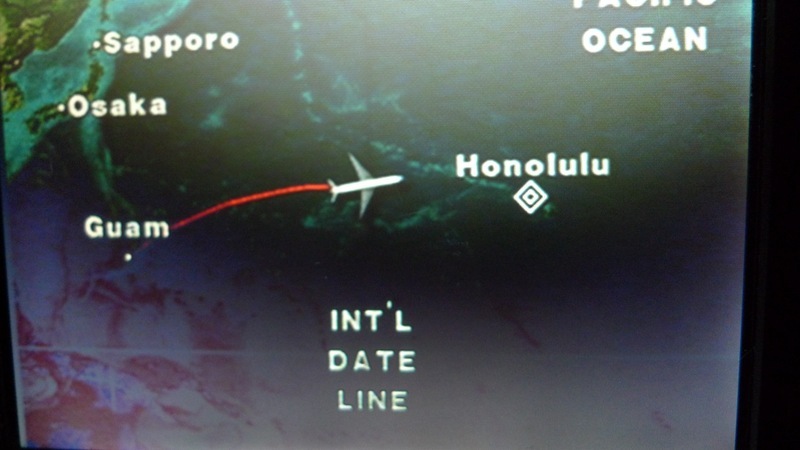 About four hours into the flight, we crossed the International Date Line, suddenly gaining back 24 hours of our lives. In fact, this flight was so funky because of the IDL that when I tried to book it on Continental’s website, it wouldn’t let me. I had to go to their ticketing agent in Bangkok to get it done. The reason? 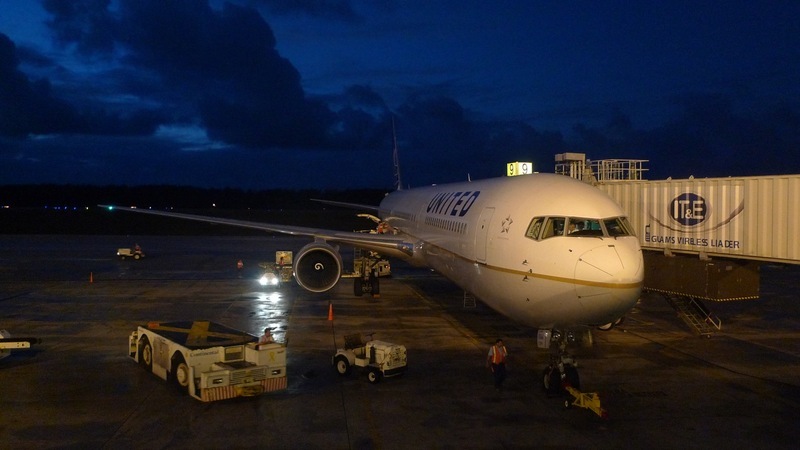 We left Hong Kong on Friday evening, arrived Guam Saturday morning, departed Guam Saturday morning, arrived Honolulu Friday afternoon, then connected to a codeshare flight to Lihue on Friday evening. That “back and forth” with the dates confused Continental’s computers, I guess. About 70 minutes before landing the flight attendants passed out snack trays with turkey sandwiches every bit as dry as the ones I made for our Bangkok to Hong Kong flight! 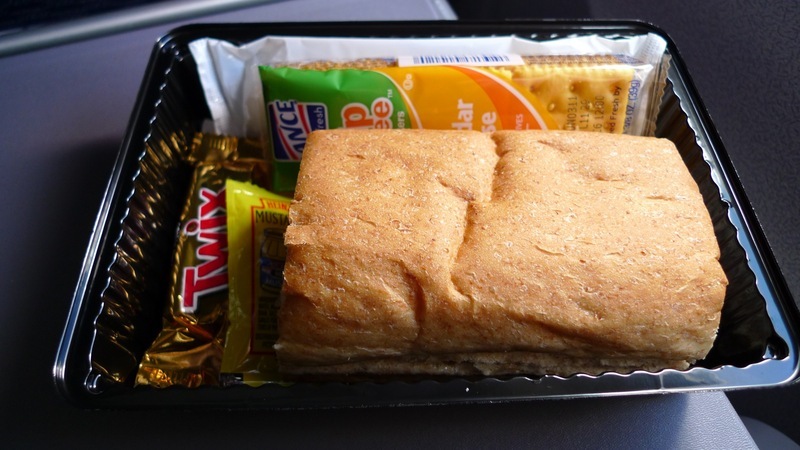 Also included were a Twix bar and cheddar cheese flavored crackers. Not the culinary highlight of the flight. Watching palm trees swaying in the breeze, we pulled into our gate next to an Air Canada jet (bet the crew is glad to be working that route!) and after about 29 hours had finally arrived in Hawai’i. But we still had one more flight to reach our destination… stay tuned! This entry was posted in Uncategorized and tagged Airlines, Airports, aviation, Continental, Guam, hong kong, Honolulu, report, trip by christao408. Bookmark the permalink. Interesting, Chris, that a post of airplane interiors, airplane food, and airports can be as interesting as this one. Are the day rooms in HK true rooms, or are they those stacked spaces that I’ve read of? I love the description of the computer confusion about the IDL dates/times! I must be the only one that likes to watch take off and landings. I think I’ve watched every Kai Tak landing videos on YouTube too. 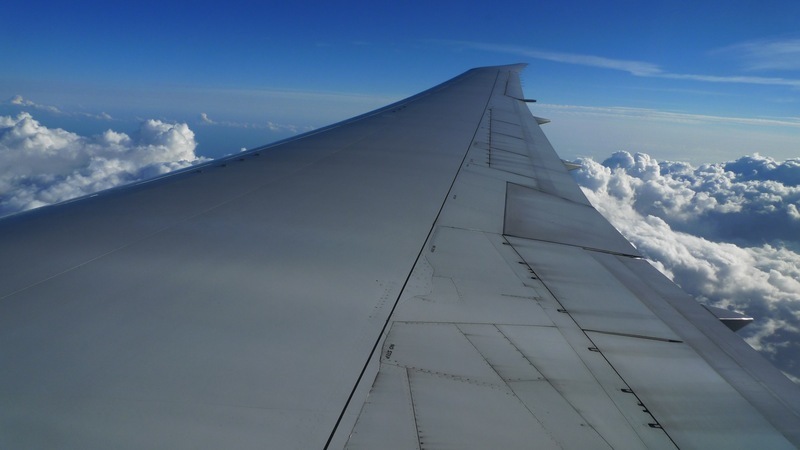 For some reason, I can’t sleep on planes – mostly dozing on and off. Another detailed account of the trip! 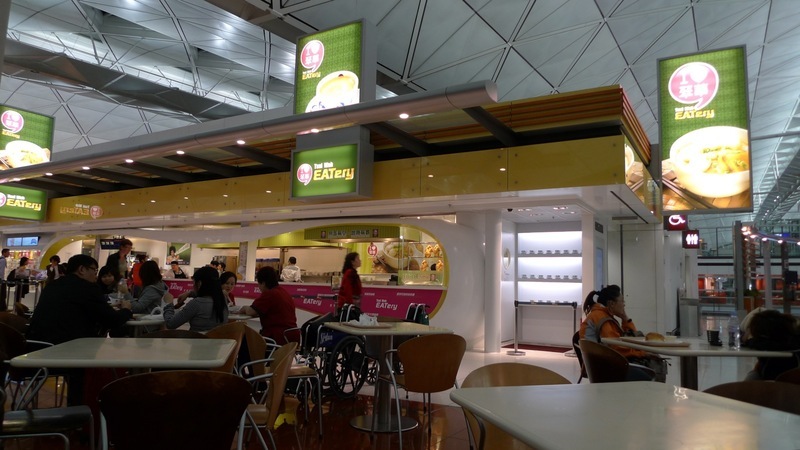 I’d like to try the Tsui Wah at the HKG airport, never knew where the overnight rentals are. The in-flight ‘meals’ are just okay, I suppose. But your account of the transfer procedure in Guam is quite unusual! 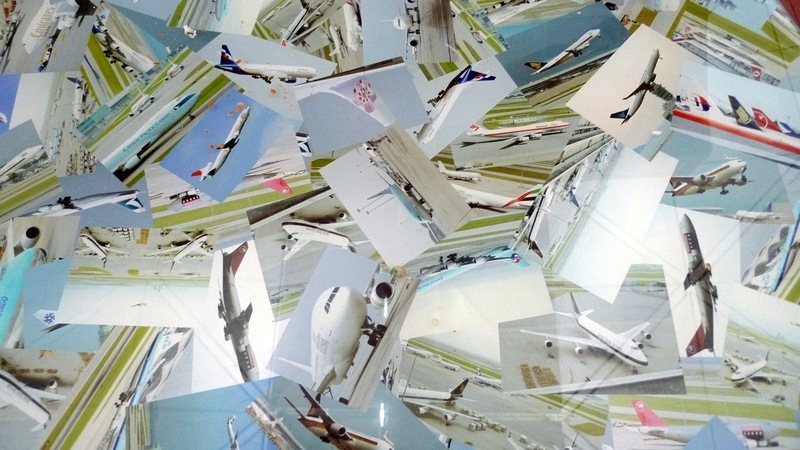 @ElusiveWords – I think most pilots will cringe when flying in & out of Kai Tak airport! A) I really dislike that map they show on flights (how far along you are in the journey). They always seem to go so slow!B) Really not a big fan of food on any American airliner. 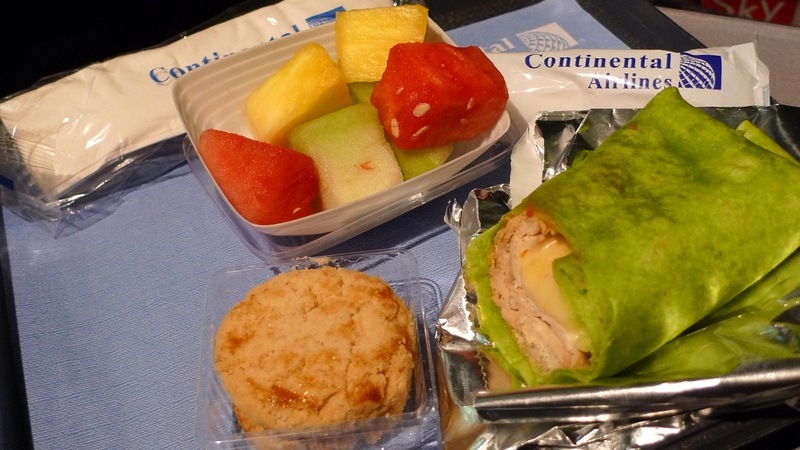 Have you seen the website where people submit pics of in-flight food? I don’t have the link on me now but can link you if you want. Personally, Austrian Air and Korean Air have had the best food so far. The last time I traveled with my Macbook with me, I remember there was free wifi at the airport, which is great! Lifesaver when traveling with kids. As for that play area with the plane, I will make sure we take the kids there for our trip next week. I also totally think there should be one for the adults! Do you know how many times I’ve seen clueless grown ups not knowing where the seat numbers are. And they don’t even bother using their eyes! If there were these “play” planes scattered around the airport, it could educate these grown-ups on what to expect as well.Wish us luck next week. We’re traveling on a DAY flight to Melbourne with 3 kids. Its going to be the first time in a LONG time for us take a day flight. I just know Thomas will be bored out of his mind and causing havoc for all the poor passengers seated near us. I also feel bad for myself already when I have to fly back 2 weeks later without Chris and the 3 kids! WAAAAAH!!! i think when we visited HK in the mid 80’s we landed at the old airport. watching it here, sure made me feel uncomfortable. I thought the plane was going to knock that tree down and come down with it. The take offs and landings were good Chris, but I am so sick of all the security checks and the immigration hassels… coming from India and Dubai, it was really frustrating. must be my age! I really enjoy how you notice all these little details. It’s like, I’m there with you and judging the entertainment systems on these planes! also, horray for the Air Canada plane, although to be honest, they’re just as bad/good as united. I guess it’s because they’re all part of the star alliance anyways. The PIA livery is so beautiful… I think they redesigned recently. The Old HK airport landing video is so crazy!!! It would have been amazing to experience it first hand. @murisopsis – I always think of the jet lag as the after-effects in the days following travel. At this point we were just plain old tired. @Dezinerdreams – They did a redesign a few years ago and I think it is quite nice. 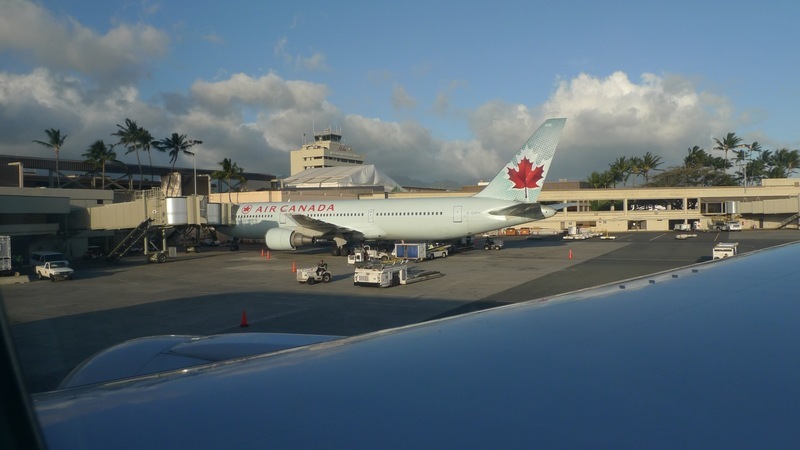 @AzureRecollections – Air Canada is just United in a minty green color scheme. Other than their Maple Leaf Lounges, which I’ve found to be quite good, there’s just no love between me and AC. @ZSA_MD – Oh, I’m sure that was where you landed. Hopefully you weren’t sitting at a window seat! Ha ha! @tehls – You have my sympathy. Hopefully you are surrounded by understanding fellow travelers. @kunhuo42 – Left seat for next time – thus noted. Generally, I try and sit on the right side of a twin-aisle plane because while the seats are evenly distributed, a higher percentage of people walk down the left aisle when boarding, so things on the right aisle are less crowded, including bin space. @moolgishin – A) That’s because the world’s a big place! =D b) airlinermeals.net – am familiar with it but stopped reading after I contributed a few pictures but had troubles getting them posted. I’ll focus my efforts where they better pay off. @ThePrince – Sometimes it is surprisingly good. @ElusiveWords – I can only rarely sleep on planes, and only the few times when I’ve upgraded and been on really good seats. @slmret – The day rooms are mini hotel rooms, not cubicles. But they are pretty small. I failed to get a picture because the arrangement doesn’t allow for a picture without your reflection showing in the mirror. When you walk in the door the room is about 6′ wide by about 9′ deep. There is a mattress on the right, basically a twin bed or just a hair wider, the space around it has walls to the ceiling and some extra pillows so you can prop yourself up, sit upright, watch TV (flat screen on the same wall as the door). The walkway is the same width as the door and continued past the mattress then to the bathroom area. Sink, etc. are directly in front of you as you walk in, toilet to the right of that, and shower stall to the right, arranged in such a way that if two people were in the room (tight fit!) the person sitting on the bed wouldn’t see the person in the shower or on the toilet, but there’s still no door between the bathroom and bed area. All in all, it is nicely decorated in dark tones, kind of soothing. If I hadn’t been kind of wound up, I suppose I might have slept better. 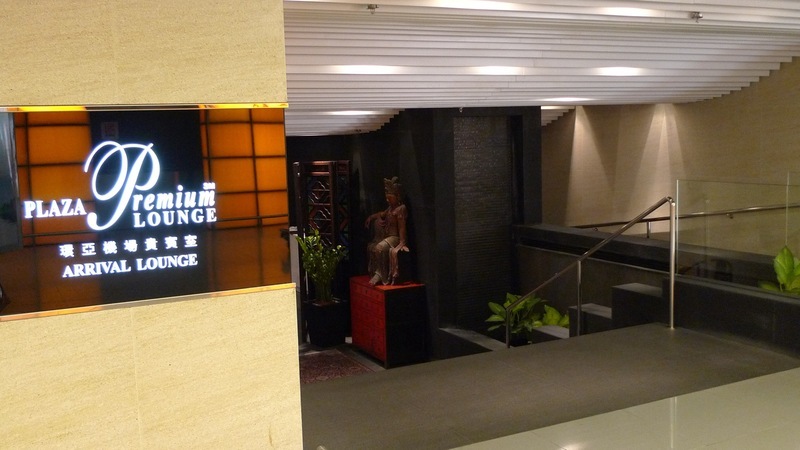 @CurryPuffy – There are three or four Plaza Premium Lounges, three inside the paid area and the one in the public area in Terminal 2. All of them have paid access, no membership required. There is an attended bag check in Terminal 1 arrivals level and lockers in Terminal 2. @christao408 – Wow — that sounds like a pretty nice room when you just want to sleep after a long flight! Thanks for the description! 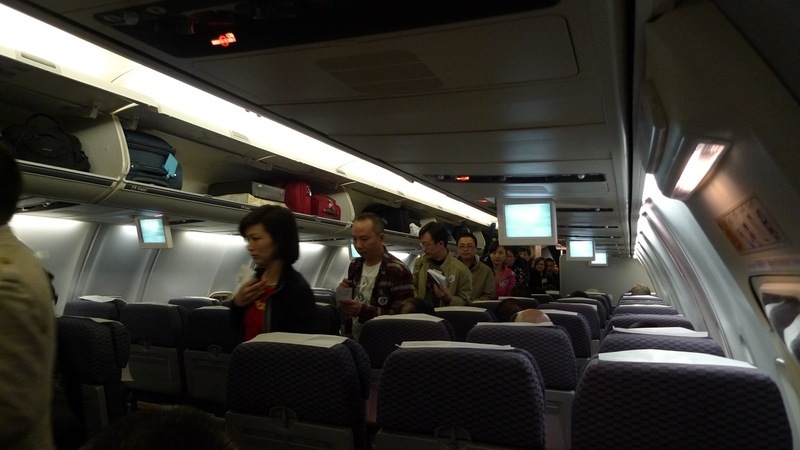 @christao408 – i never thought about that, but you’re right… i guess since everyone boards from the left side of the plane, they tend to walk down the left aisle. @kunhuo42 – Exactly, even if a family is sitting together in all the middle seats, the whole of them will walk down the left aisle. @slmret – I thought about drawing a picture and posting it; hopefully, I was clear enough. =D Oh, Tawn and I are going to be in Los Angeles in the first half of June to vacation with my sister and her family. If we can make our schedules work, I would enjoy meeting you, maybe for tea down in SJC? @christao408 – Yes — that was very clear! And again, what neat little rooms to grab a nap between flights! Would love to meet you in June, and tea in SJC sounds great — there are several neat little places by the train station! I expect I’ll be here — let me know when is good for you. @christine24666 – Thanks for the kind words. I’ll try to keep the number of pictures and quality of descriptions as high as I can.